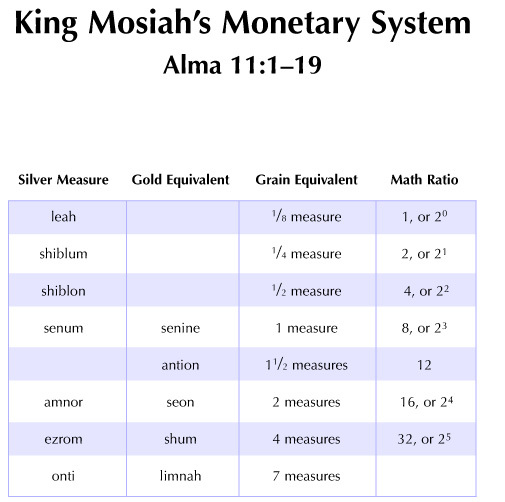 King Mosiah's system of weights and measures established equivalencies between amounts of silver, gold, and grains. This chart compares the precious metals with their grain equivalents, as described in Alma 11. These measurements for the most part increase exponentially, much like the ancient Egyptian system of measurement (see chart 113). In King Mosiah's system, the limnah or onti, worth "the value of . . . all" measurements (Alma 11:10), was worth the sum of the gold senine, seon, and shum or the silver senum, amnor, and ezrom.